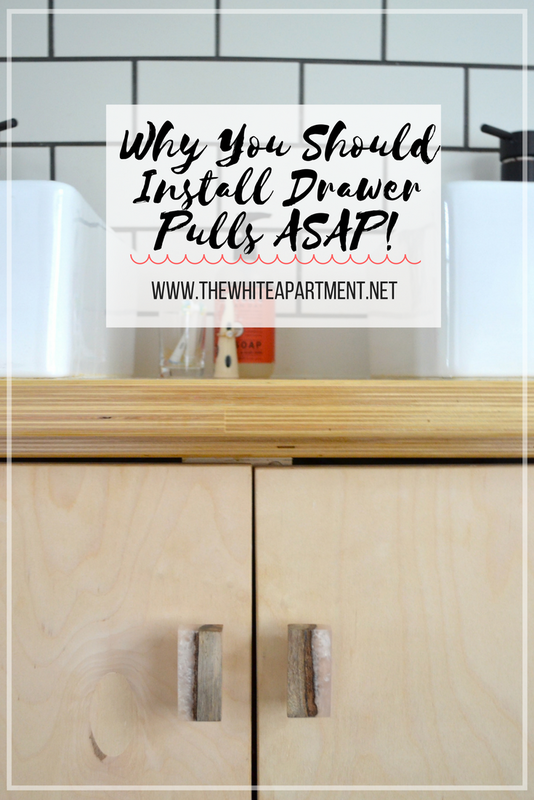 Why You Should Install Drawer Pulls ASAP! On Friday I told you that one of my big goals for the upstairs bathroom was to get it set-up so we actually can start using it and get a little more shower space. One of the biggest obstacles has been the clawfoot tub, but operation get-the-clawfoot-tub-shower-ready is well under way, so we’ve moved on to something else. That is the lack of pulls on the cabinet or drawers. This has been especially problematic because the drawers are flush to the vanity. The top one had a little piece of painters tape sticking out so you could pull it open, but the bottom one didn’t. So you had to pull the top one out, reach underneath, pull the bottom one out enough that it was open but not so much that you squished your fingers between the two. As you can see, it was not a great set-up. Luckily that’s an easy fix! We just needed to add some pulls. I really love small design features like this because I feel like I can “splurge” and it still doesn’t break the bank. AND it adds a lot to the feel of the space. Since we put the pulls in a few days ago I’ve been so happy. Honestly, every time I walk in there I get excited about them. It’s silly what such a small thing can do for my mood, but this is a great example of “the easy stuff” I talked about in this post. Not having pulls was not the end of the world and by far not the worst thing we had to deal with. But, even though we weren’t showering in that bathroom we were using it for everything else. Brushing teeth, fixing hair, doing make-up, storing vitamins. You get the idea. And not being able to easily open the drawer and cabinet was a little annoyance we had to deal with multiple times each day. You don’t realize until you fix it just how much that little thing might have actually been annoying you. So it feels really good to get the pulls on! I found these pulls at Anthropologie. It’s obviously my go-to place for them (I think it’s everyone’s?). They were $10 a piece, which is a bit pricey for what you get, but we only needed four so all-in-all it didn’t add up to that much. And, I believe a mix of luxurious items and budget pieces is something that makes for beautiful design. In that regard it was an inexpensive way to make the space feel higher end and for us a no-brainer. However, World Market has a lot of good options as well that are significantly cheaper. I’ve linked to some of my favorites from both places below. Don't forget to pin this and save it for later!